TfL concluded that over 60% of people who responded to the consultation supported the scheme. But this was wrong. TfL ignored the petition designed by Daniel Howard which was signed by over 4,000 people. This is despite TfL confirming on several occasions that they would take the petition into account. Had they included Daniel Howard’s petition signatories, they would have found that over 60% of those who responded to the scheme were against the scheme. 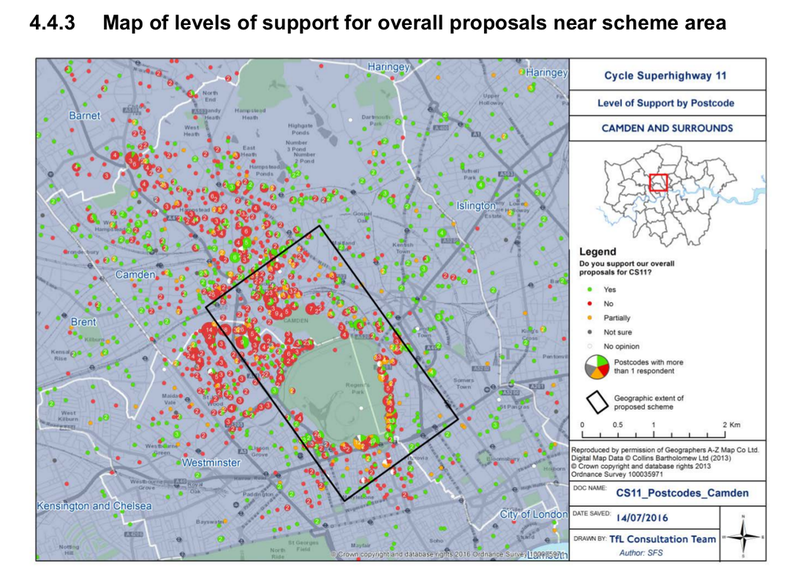 You will see very clearly from the multitude of red dots that locals immediately around CS11 are firmly against the scheme. Decisions are best made when taking into account the views of locals as stated by Mayor Sadiq Khan. The views of locals should outweigh those of others in relation to this type of scheme.